Come, Holy Spirit, by whom every devout soul, who believes in Christ is sanctified to become a citizen of the City of God! (en. Ps.45:8) Come, Holy Spirit, grant that we receive the motions of God, put in us your flame, enlighten us and raise us up to God (s. 128,4). Since many have undertaken to compile a narrative of the events that have been fulfilled among us, just as those who were eyewitnesses from the beginning and ministers of the word have handed them down to us, I, too, have decided, after investigating everything accurately anew, to write it down in an orderly sequence for you, most excellent Theophilus, so that you may realize the certainty of the teachings you have received. This introduction does not yet correspond to the Gospel narrative. Nevertheless, it makes us know that Luke himself also wrote the book entitled Acts of the Apostles; not only because it also contains the name Theophilus, though it can happen that it is another Theophilus, and in the case it was the same person, another could have written it; all the same Luke wrote him the Gospel because, he further says there in the exordium: In the first book I told you, oh Theophilus, everything that Jesus began to do and to teach until the day when he chose his apostles and, commanding them through the Holy Spirit, he ordered them to preach the Gospel (Acts 1:12). Here he makes us understand that he had already written the book of the Gospel, one of the four, whose authority is sublime in the Church. 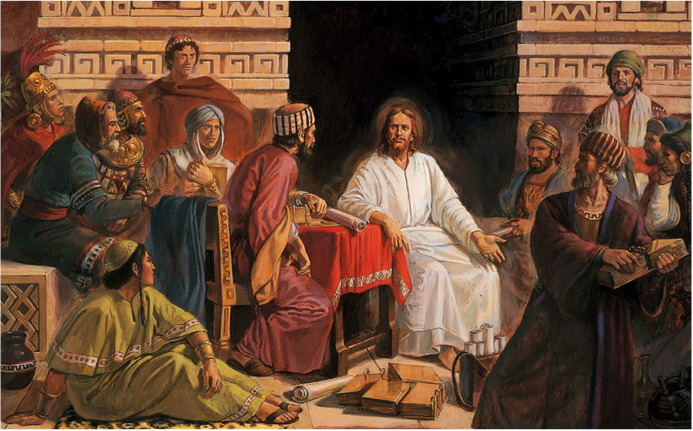 By the fact of saying that he had spoken of everything that Jesus started to do and to teach until the day he commanded his apostles, it must not be thought that he wrote in his Gospel everything that Jesus did and said while living with the apostles on earth, in order not to contradict John, who mentions that Jesus did many other things that, if they would have been written, the whole world could not contain the books (Jn. 21:25); it is even more obvious that the other evangelists narrated no few things that Luke himself did not touch in his narrative. Therefore, he spoke of everything choosing what he judged to be fit, coherent and sufficient to fulfill the duty of his ministry (cons. eu. 4, 9). “On the text today, Jesus himself confirms that he was filled with the Holy Spirit, for it is written: The Spirit of the Lord is upon me, because he has anointed me to bring the Good News to the poor (Lk. 4:18).Yes, to evangelize the poor he has been anointed, because the Spirit of the Lord was upon him; what Good News did he bring to the poor but that he had the Spirit of the Lord, with whom he was filled? This also is written about him, that he was filled with the Holy Spirit” (c. s. Arian 18). “From the transgression of the first man, the conquering devil had possession of the whole human race born in the chain of sin. If we had not been subjected to captivity, we would have no need of a redeemer. He who had not been captured, came to the captives; he who in himself had nothing of captivity, that is nothing of evil, he came to redeem the captives, but he bore our price in his mortal flesh. For if he did not have mortal flesh, how would the Word have the blood in order to shed it for the captives? He who descended to our captivity in the likeness of the flesh of sin (Rom 8:5) did not come with the flesh of sin. That flesh was a likeness of the flesh of sin (Rom 8:3); true flesh but only a likeness to the flesh of sin; true flesh, but not flesh of sin. Who was it, then, who came in this form? Proclaim from day to day (Ps 95:2). Look who it was, he was “from day to day, he was God from God, Light from light. Nevertheless, the Word became flesh and dwelt among us (Jn. 1:14), hiding his majesty, showing his weakness, so that this may die and that may live” (s. 27,2,2). With the text, let us now pray from the depths of our heart. I suggest the following phrases and questions that can awaken in you dialogue with God, and at the same time can give rise to affections and sentiments in your dialogue with God. Do not move to the next phrase of question if you can still continue dialoguing with God in one of them. It is not a matter of exhausting the list, but of helping you to pray with some points that better fit your personal experience. At that time, Jesus returned to Galilee with the power of the Holy Spirit (Lk. 4:14). What importance does the Holy Spirit have in my life? What does this phrase of St. Augustine suggest to you? “It is the Spirit of God who fights in you against you, against what is in you contrary to you” (s. 128, 9). “He has sent me to proclaim the Good News to the poor, to announce liberty to captives, and give sight to the blind” (Lk. 4:18). How can you prolong in your life the mission of Jesus? What “poor,” “captives,” or “blind” are there around you? What does this phrase of St. Augustine suggest to you? He shed his blood for the sick and with the drop of his blood he anointed the eyes of the blind” (s. 265F, 1). Pray with this phrase: “Spirit of God guide me, act in me” (s. 335J, 4). Experience and contemplate in your interior how God daily frees you from your captivities, breaks your chains, and opens your eyes. Thank Christ for his redemptive action. Contemplate Christ, the anointed and the one sent by the Father. While you contemplate him, tell him interiorly with your heart: “You are my salvation” (conf. 1, 5). Lord God, Father Almighty, with pure heart, as far as my smallness permits, allow us to give you our most devoted and sincere thanks, begging with all our strength from your particular goodness, that by your power you may drive away the enemy from all our thoughts and actions; that you may increase our faith, govern our mind, give us spiritual thoughts, and bring us to your happiness, through your Son Jesus Christ, our Lord, who with you lives and reigns, in the unity of the Holy Spirit, God, forever and ever. Amen (en. Ps 150:8). When this Spirit, God from God, is given to man, it inflames him in love for God and his neighbor, because He is love” (trin. 15, 17,31).